In “The Secret Fire”, the novel’s villain Isambard says “ringing the bell” at a sacred site can be taken as a metaphor for accessing whatever earthly (or unearthly) powers may reside there. In the case of Aldwych, just west of the City of London, he is undoubtedly referring to the healing waters underfoot. At least three holy wells and healing springs are recorded in the area, which is the venue for some of the novel’s key action. Before the construction of Kingsway and the crescent now known as Aldwych in the early 20th century, the current site of Australia House, Bush House and India House consisted of two narrow, disreputable streets, home to rough taverns and bawdy booksellers, called Wych Street and Holywell Street. At the rear of a public house called “The Spotted Dog” on Holywell Street (different sources give the street number as 23 or 24), a choked-up well existed which locals believed to have been the original holy well that gave the street its name, according to Charles Gordon’s 1903 book “Old Time Aldwych” (where the illustration above appears). The site of the holy well is marked on the Ordnance Survey map of 1894 (see below). According to David Furlong, a writer on such matters, Australia House now stands over the original sacred spring, which is accessible only via a manhole. He provides a photograph of the clean, limpid water. The 1894 map also shows the site of another holy well, that of St Clement, located a short walk to the northeast. It is now buried under the car park of the Royal Courts of Justice. And a few hundred yards to the southwest, on a narrow street called Strand Lane (formerly a riverbed) leading down towards the Thames, another healing spring can be found. Called the “Roman Baths”, the spring feeds into a vaulted chamber (probably built in medieval or Elizabethan rather than Roman times) that can be seen through a street-level window at 5, Strand Lane. Holy wells were often the site of medieval Christian mystery play performances. It is fitting, then, that two playhouses — the Opera Comique and the Globe Theatre, both with underground auditoria — were built right next to the location of the Aldwych holy well in the late 19th century. The area remains a focus of London theatre life, of course, and underground water still flows beneath the sub-stage area of the Aldwych Theatre. High above the great curving thoroughfare of Aldwych, meanwhile, the tolling of a remarkable bell may sometimes be heard. Called “Robertus”, after its Elizabethan maker Robert Mot of the Whitechapel Bell Foundry, it hangs in the bell tower of St Clement Danes church — the location of the climactic action of “The Secret Fire” (in which Robertus also plays a significant part). Robertus is the church’s Sanctus bell, formerly rung to mark the moment of Consecration during Mass. Although the bells of St Clement’s are known for their daily renditions of the sinister children’s song Oranges and Lemons, Robertus doesn’t participate; the tune is played on different, younger bells. Robertus’ sonorous E note is now rung solely as a service call bell. It is, nevertheless, a powerful voice that has defied time and destruction. Robertus was cast in 1588 — the year of the defeat of the Spanish Armada. Since then, it has seen off 17 British monarchs, the Great Fire of London and even the demolition of St Clement Danes (rebuilt in 1681, by Sir Christopher Wren). The Sanctus bell was almost lost, though, to enemy action in 1941. On the night of May 10-11 of that year, when London suffered one of the heaviest nights of Nazi bombing of the Blitz, St Clement Danes was hit by an incendiary bomb. Its steeple (seen left, with the Royal Courts of Justice in the background) burned like a Roman candle. Its church bells came crashing to the ground. All were cracked beyond repair — except for Robertus. The Sanctus bell was miraculously unharmed. For the next 12 years all the bells were kept buried in sand in a brick shed at the foot of the bell tower, as weeds and flowers slowly reclaimed the burned-out ruins of the church. Not until the Royal Air Force took over St Clement’s as its own central church, and as a memorial to Allied Air Forces war dead, were the bells removed for recasting. 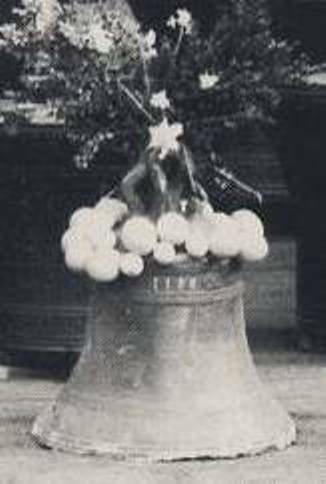 At a dedication ceremony at the church in 1957, when according to ancient custom all the recast bells were also given new names, only undamaged Robertus was deemed to have retained its original status from 1588 as a named and dedicated bell. Accordingly, while all the other bells were arrayed mouth-up for the ceremony, Robertus, garlanded with flowers, was accorded the honour of being presented mouth-down. 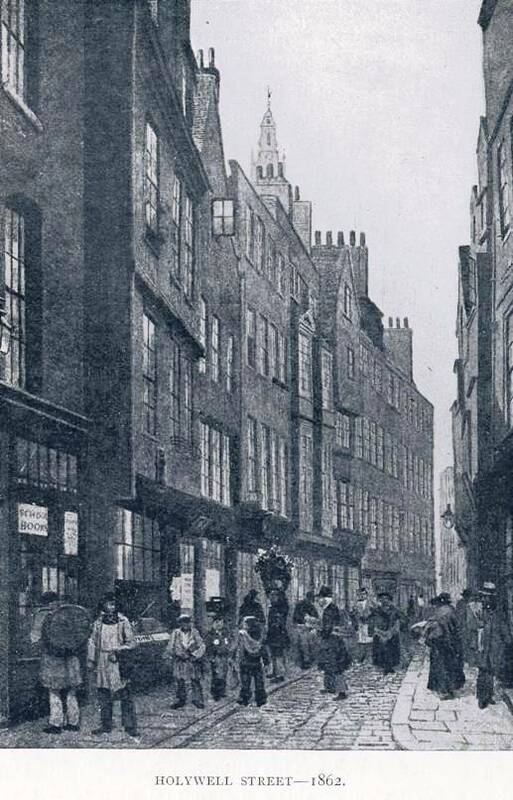 “We have heard the chimes at midnight,” Sir John Falstaff tells Master Shallow in King Henry IV part two, as the latter reminisces about his student days at Clement’s Inn, one of the Elizabethan legal establishments just east of Aldwych. Robertus may be one of the few surviving bells Shakespeare — aged just 24, and a new arrival in London when Robertus was first cast — had in mind. For those who would like to hear the bells of St Clement’s — and the bells of all the other London churches named in “Oranges and Lemons” — they were recently recorded by composer Benjamin Till for a mesmerising new choral work. To hear it and read about his work, click here.